The 35th annual Nativity Carnival is happening this weekend at Nativity School (Oak Grove and Laurel) starting tomorrow, June 5 at 5:00 pm. It will be open Saturday, June 6 from noon to 11:00 pm and Sunday, June 7, from noon to 6:00 pm. Admission is free. 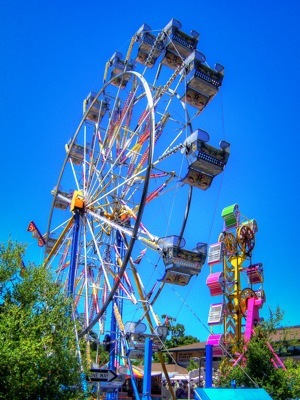 In addition to 20 carnival rides and dozens of game booths, there will be free, live entertainment: D. B. Walker Band from 6:00 to 10:00 pm on June 5, Ginger + Bandit from 3:00 t0 4:30 pm on June 6, Pride and Joy from 6:00 t0 10:00 pm on June 6, and Real Story Band from 2:00 to 6:00 pm on June 7. This year’s grand prize in the raffle is a 2015 Mercedes Benz C250 or $25,000 in cash. Second price is $1,000 cash and third prize $500 cash. The food court features rotisserie chicken, pasta, bruschetta, philly cheesesteaks, bbq hamburgers and hotdogs, turkey legs, and tri-tip. The Tiki Lounge features five beers on tap, margaritas, wine, premium tequila shots and specialty drinks. All proceeds benefit Nativity Parish in Menlo Park.